"Welcome to Jurassic Park!" With the death of the great Richard Attenborough this week, the industry has been outspoken in their love for the legendary actor/filmmaker. One of the roles he is remembered for the most is Dr. John Hammond from Jurassic Park, the man who loved dinosaurs so much he had to bring them back to life. 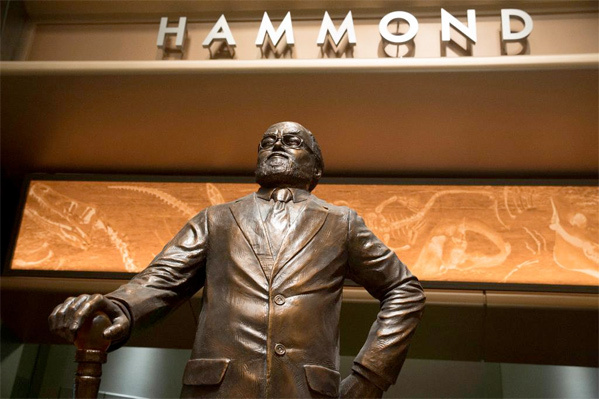 Steven Spielberg wrote about how Attenborough "was the perfect ringmaster to bring the dinosaurs back", but now the director of the new Jurassic World, Colin Trevorrow, has chimed in with his own "In Memoriam": a photo of a John Hammond statue, which we can only assume is from the new movie. Trevorrow explains the new park, which is a ferry ride from Costa Rica (via SlashFilm): "It has elements of a biological preserve, a safari, a zoo, and a theme park. There is a luxury resort with hotels, restaurants, nightlife and a golf course. And there are dinosaurs. Real ones. You can get closer to them than you ever imagined possible. It’s the realization of John Hammond’s dream, and I think you’ll want to go there." For more updates on Jurassic World straight from director Colin Trevorrow follow him @colintrevorrow. The franchise may carry on, but it will never be the same without Hammond. Jake Johnson playing off Chris Pratt...please!